Tornado Yarn from Ivy Brambles is full of thick and thin surprises to keep your knitting fun and beautiful! This fantastically soft merino wool yarn knits to a gauge of 12 sts over 4 inches. Tornado Yarn is 100% made in the USA and hand dyed in New Hampshire. The unusual twist takes dye in a spectacular way providing rich colorways that are full of character. 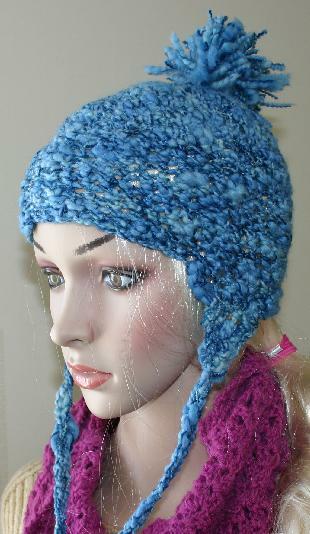 Knits quickly on size 11 needles, perfect for accessories, hats, scarves and sweaters. Tornado works up beautiful whether knit or crocheted.....check out these beautiful new patterns worked up in this gorgeous yarn!!! The Tornado shrug is a fabulous lace shrug made with Ivy Brambles thick and thin Tornado yarn. The shrug features a feather and fan lace pattern and buttons under the arms for a comfortable and secure fit. 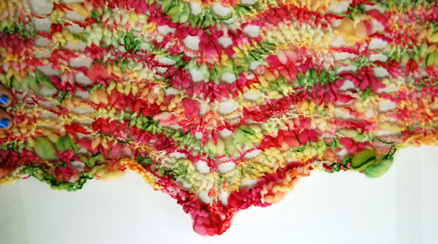 Knit on big needles this is a lace pattern that will knit up quickly and enjoyably! Shown in Ivy Brambles Tornado Celosia Colorway, and requires 2 Skeins of Tornado Yarn and a US #13 needle. This fun, warm and easy earflap hat is worked entirely in single crochet using a size N hook and only requires one skein of Tornado. Shown in Ivy Brambles Tornado Wild Blueberry colorway. Plenty going on at Yarn and Fiber :) A couple of other items to note: Blue Heron Rayon Metallic is back in stock! New colors to keep your knitting needles happy! Mmmm, sparkly! Blue Heron Yarns Rayon Metallic Yarn is 100% rayon hand dyed yarn with a fine metallic thread twisted into the yarn. This yarn is perfect for knitters, crocheters and weavers and is available in 550 yard 8 oz hanks. This yarn is DK weight. And no two are alike!!!!! We have acquired a very special personal collection that is as eclectic as it is exciting.... just this week alone, three new sewers have been born just from being inspired by the assortment! (Don't know how to sew a quilt block but want to get started? Tuesday afternoons from 2-5 at the shop - Krazy Cuts Quilt Blocks - a new block every week offered by Cyndi.... contact us for more information 603-505-4432). Check out the selection in person in the store, or order directly online! Oh, did I forget to mention the Krazy Cuts Scrap Bins.... silly me. Not big enough for a fat quarter, not straight enough for a strip, find it here, some big, some small, some batiks and some prints, some vintage and some modern. Sold by the pound. If you are looking for crazy fun you have found it with this eclectic grouping of fabrics! This mix is a menagerie of color. You will get a minimum of three colors but you could get many more colors in your mix - you just never know - these will be chosen randomly which just ups the fun factor. No particular color requests please. These are so fun to play with. They can be easily be used for piecing, crazy-quilting, applique and all kinds of crafts. Sewing with these is so much more addicting because you just can't wait to see how the color combinations unfold! Order as many pounds as you want today and get started on this rare opportunity to receive a mystery envelope of vintage and modern fabrics just waiting to add life to your next project! Krazy Cuts are sold by the pound at a great price!